Hughes, R. M., Simons, B. W. and Hurley, P. J. (2017). A Murine Orthotopic Allograft to Model Prostate Cancer Growth and Metastasis. Bio-protocol 7(4): e2137. DOI: 10.21769/BioProtoc.2137. Prostate cancer is one of the most common cancers in men in the United States. Comprehensive understanding of the biology contributing to prostate cancer will have important clinical implications. Animal models have greatly impacted our knowledge of disease and will continue to be a valuable resource for future studies. Herein, we describe a detailed protocol for the orthotopic engraftment of a murine prostate cancer cell line (Myc-CaP) into the anterior prostate of an immune competent mouse. Prostate cancer is a leading cause of cancer death in men due to a subset of cancers that metastasize. The genetic and molecular factors that drive local tumor development and progression to metastatic disease, however, remain incompletely understood. Both genetically engineered mouse (GEM) models and xenograft models of prostate cancer have contributed to our understanding of the genetics of prostate cancer (Ittmann et al., 2013; Park et al., 2010). Genetic manipulation, either by prostate specific transgenic overexpression such as in Hi-Myc mice (Ellwood-Yen et al., 2003) or by prostate specific deletion such as in Pten-/- mice (Wang et al., 2003), is advantageous because it models tumor development and progression in the organ microenvironment in an immune competent mouse. Development of metastatic prostate cancer is variable among these GEM models, with a low frequency in some such as the Pten-/- model (Wang et al., 2003), and a higher frequency in other models such as TRAMP (transgenic adenocarcinoma mouse prostate) (Greenberg et al., 1995) and Hi-Myc/Pten-/- (Hubbard et al., 2016). Despite their great utility for prostate cancer research, it is difficult, time-consuming, and costly to further genetically manipulate GEM models. To overcome some of these limitations, researchers have relied on both subcutaneous and orthotopic xenografts of human cell lines. Cell lines can be genetically manipulated in vitro in a variety of ways. While subcutaneous xenografts are advantageous due to their ease of injection and monitoring, orthotopic xenografts better recapitulate the local tumor microenvironment which may affect sensitivity to drugs (Wilmanns et al., 1992; Kuo et al., 1993), methylation patterns (Fleming et al., 2010), growth rate (Fleming et al., 2010), and ultimately predictions for clinical response (Killion et al., 1998; Hoffman, 1999). In addition, some human prostate cancer cell line models metastasize from xenografts implanted orthotopically. A limitation of all xenograft models is that they require immunocompromised mice making it difficult to model tumor progression in an intact immune system. The Myc-CaP cell line (Watson et al., 2005) allows for engraftment either subcutaneously or orthotopically in immune competent syngeneic (FVB/N) mice (Watson et al., 2005; Hurley et al., 2015). Myc-CaP was derived from a prostate carcinoma from a Hi-Myc mouse (Watson et al., 2005). When engrafted orthotopically, Myc-CaP cells metastasize to abdominal lymph nodes, liver, and lung (Hurley et al., 2015). 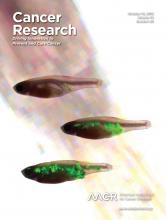 Additionally, Myc-CaP is amenable to in vitro manipulation of gene expression (Hurley et al., 2015). Thus, Myc-CaP can be used as an easily manipulable model for both tumor growth in the prostate and metastatic growth in mice with an intact immune system. Herein, we describe the methods for orthotopic engraftment of Myc-CaP cells into the mouse anterior prostate. Note: Post-pubescent mice have androgen signaling and a larger prostate that facilitates ease of engraftment. We also recommend using mice that are approximately the same age and weight. Male GEM models can also be used as long as they are fully back-crossed to FVB/N. Note: All procedures conducted in mice must first have institutional ACUC approval. Propagate Myc-CaP cells in tissue culture flasks with Myc-CaP growth media and passage as per ATCC guidelines. Engraft 1 x 106 Myc-CaP cells per mouse. Due to ‘dead space’ within the needle, overestimate the number of allografts needed by 20% or a minimum of two extra allografts. Note: Injecting more than 1 x 106 Myc-CaP cells per mouse is not recommended as it will accelerate primary tumor growth and shorten the time between engraftment and euthanasia due to morbidity. This may decrease the likelihood of observing metastatic disease. Prior to harvesting Myc-CaP cells for injection, thaw Matrigel on ice. Remove media from flasks containing 80-90% confluent monolayers of Myc-CaP cells, wash cells with 1x PBS, and detach cells by incubating in 0.05% trypsin-EDTA for 3-6 min in 37 °C incubator. Neutralize trypsin by adding growth media. Transfer cells to a 50 ml conical tube and centrifuge at 300 x g for 5 min. Remove trypsin/media and then resuspend the cell pellet in fresh growth media. Count cells to isolate 1 x 106 cells per allograft. Centrifuge isolated cell suspension at 300 x g for 5 min. Perform the following step on ice. Remove media and resuspend cell pellet in Matrigel to a volume of 10 μl per 1 x 106 cells. Keep cell:Matrigel mixture on ice until engraftment. Note: Thoroughly mix cell:Matrigel prior to engraftment. Perform engraftment in a laminar flow hood using aseptic techniques, as per your institutional Animal Care and Use Committee (ACUC) guidelines. Wear a mask, cap, clean lab coat, arm covers, and sterile gloves throughout the procedure. Sterilize instruments using a glass bead sterilizer, and disinfect with 70% ethanol between animals. Induce general anesthesia using a 2 L induction chamber by inhalation of 2% isoflurane in oxygen. Following complete anesthesia induction, maintain anesthesia by nose cone at approximately 1.5% isoflurane, adjusted as needed to maintain a deep plane of anesthesia (Figure 1). The level of anesthesia is sufficient for surgery when pinching of the skin between the digits does not stimulate pedal withdrawal. Provide preemptive analgesia according to your institutional guidelines. Note: As per our institutionally approved animal protocol, we inject mice subcutaneously with 5 mg/kg Carprofen diluted in sterile saline to a total volume of 0.5 ml. Place the anesthetized mouse in dorsal recumbency, shave hair over the surgical site, and swab the surgical site with Betadine followed by 70% alcohol wipes (Figure 1). Using sterile scissors and fine forceps, make a horizontal incision 1 cm in length at 2 mm above the preputial gland (Figure 1, and Bertrand et al., 2016). Once the abdominal wall is exposed, make a similar incision to open the abdomen (Figure 1). Use fine forceps to manipulate the bladder gently out of the abdomen and caudally toward the prepuce. This exposes the seminal vesicles and attached anterior prostate lobes (Figure 1, and Oliveira et al., 2016). Gently coax one seminal vesicle and anterior prostate out of the abdomen with fine forceps, cotton swabs, or gentle pressure on the abdomen (Figure 1). Take special care to prevent damage to the seminal vesicles, as leakage of seminal fluid into the abdomen will incite an intense inflammatory reaction. After exposing and exteriorizing the seminal vesicle, insert a 25 µl Hamilton syringe preloaded with the Myc-CaP cell:Matrigel mixture and fitted with a 30 G ½” needle longitudinally into the anterior prostate (parallel to the length of the seminal vesicle). Slowly inject 10 μl of the mixture (equal to 1 x 106 Myc-CaP cells) into the prostate (Figure 1). Take care to avoid spillage of the injected contents when removing the needle from the anterior prostate as spillage may result in the seeding of multiple tumors in the abdomen. To avoid spillage, keep the needle in place for 1-2 sec after injection (giving the Matrigel time to solidify within the lobe) and apply gentle pressure to the injection site with a cotton swab after removing the needle. Note: Injecting more than 10 μl into the anterior lobe increases the likelihood of spillage. Other lobes of the mouse prostate can be used for injection, however, the anterior lobe offers ease of location and a reduced likelihood of urethra constriction upon growth. Lobe choice for engraftment site should remain consistent throughout the experiment. Gently return the seminal vesicle and bladder to the abdomen and then close the abdominal wall with 3-0 continuous, absorbable sutures. Close skin with 9 mm steel wound clips (Figure 1). Note: For blinded studies, mark animals with toe tattoo or ear punch as per institutional guidelines. Give each animal a unique number for identification. Figure 1. Engraftment of Myc-CaP cells into the mouse anterior prostate. A. Following induction of general anesthesia (step B2), the surgical site is shaved and cleaned with Betadine followed by alcohol wipes (step B4). A 1 cm incision is made above the preputial gland (step B5), and the anterior prostate is exposed (step B6). Myc-CaP cells are injected into the anterior prostate (step B7), and then the incision is closed with sutures and surgical clips (step B8); B. Anatomic approximation of preputial glands (P.G., dotted lines) and incision site (solid horizontal black line). Scrotum (S) and prepuce (P) are labeled for reference; C. Organ anatomy of mouse at the incision site. Bladder (B, shown emptied of urine) and seminal vesicles (S.V., left-sided exposed only) are easily identified at the incision site for their midline location and white horn-shaped structure, respectively. The anterior prostate (A.P.) lobes run parallel to the seminal vesicles attached along their lesser curvature. D. Enlarged view of Myc-CaP cell injection into the anterior prostate. After surgical site closure, place animal in a clean cage on a disinfected heating pad to maintain body temperature during recovery. Mice should be active and alert within 2 h of surgery. Monitor mice intermittently until they are alert. Monitor mice daily for signs of distress or infection such as failure to groom, weight loss, reluctance to move, labored breathing. If animals show signs of pain or distress, administer 5 mg/kg Carprofen subcutaneously every 12 h up to 72 h postoperatively. Length of engraftment depends upon experimental design and endpoints. Note: In our experience, engraftment of 1 x 106 Myc-CaP cells into the anterior prostate yields allografts approximately 60 mm3 in size and micro-metastatic disease at 21 days post engraftment (Hurley et al., 2015). Micro-metastatic disease is often difficult to appreciate grossly. Following engraftment, euthanize mice according to your institutional guidelines for necropsy. Dissect the primary tumor away from the seminal vesicle and weigh it. If the engrafted tumor cannot be dissected from the adjacent seminal vesicle, remove the tumor along with the seminal vesicle and weigh en bloc. Inspect mice for gross evidence of metastatic disease and, if present, quantify the number and location of visible macro-metastatic lesions. Photograph both the engrafted lesion and any macro-metastatic lesions. Remove the abdominal organs for formalin-fixation and paraffin embedding. Section organs for hematoxylin and eosin (H&E) staining (Slaoui and Fiette, 2011). Additionally, remove the lungs and inflate with formalin for optimal pathological examination prior to formalin fixation. To inflate the lungs, a 21 G needle attached to a 3 ml syringe filled with fixative is introduced into the trachea at its open end, forceps are used to clamp gently around the needle, and fixative is introduced until excess refluxes up the trachea (Fiette and Slaoui, 2011). A certified pathologist should analyze H&E stained slides for micro-metastatic disease. The presence of Myc-CaP cells in metastases can be confirmed via immunohistochemical (IHC) staining of formalin-fixed and paraffin embedded (FFPE) tissue for androgen receptor (AR) and Myc positivity (Figure 2). IHC staining protocol was adapted from a previously published study (Simons et al., 2015). Figure 2. Myc-CaP orthotopic allograft and staining by H&E and IHC. A. Myc-CaP orthotopic allograft (arrow) in the mouse anterior prostate. Seminal vesicle (S.V.) and anterior prostate (A.P.). H&E and IHC staining for Myc and androgen receptor (AR) of a Myc-CaP orthotopic allograft tumor; B. H&E and IHC staining of a Myc-CaP orthotopic allograft tumor (T) and adjacent seminal vesicle containing secretions (S, bright pink staining); C. H&E and IHC staining of a lung metastasis from a Myc-CaP orthotopic allograft. Positive Myc and AR staining, shown in brown, was visualized with an ImmPRESS Polymer Detection Kit and ImmPACT DAB (Vector Laboratories). IHC slides were counterstained with hematoxylin. Images at 10x magnification (20x inset) and black bars are 100 µm. We recommend considering the ARRIVE Guidelines (Kilkenny et al., 2010) for in vivo animal study design, analyses, and reporting. As outlined in the ARRIVE Guidelines, take comprehensive records of study design, experimental procedures, experimental animals, animal housing and husbandry, sample size, allocation of animals to experimental groups, experimental outcomes, and statistical methods (Kilkenny et al., 2010). To determine sample size (number of animals per experimental and control groups), first calculate the required effect size for both continuous and categorical measurements. For example, if during a pilot study we determine that the control group’s primary tumor weighs on average (0.122 g ± 0.072 g) and the experimental group’s primary tumor weighs (0.038 g ± 0.0133 g), then the effect size, d = 1.622467. Using a two-sided test with α error of probability = 0.05, power = 0.8, and an allocation ratio of control/experimental = 1, the sample size for both groups should be 8 animals to demonstrate a statistically significant difference between the groups (Festing and Altman, 2002). To account for a 20% error rate, we would use 10 animals per group. Note: A pilot study should be performed first in order to determine the appropriate sample size for a given experiment. We strongly recommend consulting with a biostatistician during the project design phase of any animal study. The appropriate statistical methods for data analysis will depend on the experimental design and experimental outcomes assessed. To improve experimental robustness, we recommend two independent experimental replications and blinded data analysis. If any animals are excluded from the final analyses, provide sound rationale for exclusion such as cell leakage into the body cavity as evidenced by multiple metastatic lesions on the body cavity wall. This protocol was adapted from a previously published study (Hurley et al., 2015). This work was supported by The Prostate Cancer Foundation Hagen Challenge Award; The Patrick C. Walsh Prostate Cancer Fund, and The Hinman Urologic Endowed Fund Educational Scholarship. Bertrand, H. G., Thomas, A. A., Ellen, Y. C., Dorward, R. S. and Flecknell, P. A. (2016). A surgical approach in the treatment of preputial gland abscesses in mice. BMC Vet Res 12: 16. Ellwood-Yen, K., Graeber, T. G., Wongvipat, J., Iruela-Arispe, M. L., Zhang, J., Matusik, R., Thomas, G. V. and Sawyers, C. L. (2003). Myc-driven murine prostate cancer shares molecular features with human prostate tumors. Cancer Cell 4(3): 223-238. Festing, M. F. and Altman, D. G. (2002). Guidelines for the design and statistical analysis of experiments using laboratory animals. ILAR J 43(4): 244-258. Fiette, L. and Slaoui, M. (2011). Necropsy and sampling procedures in rodents. Methods Mol Biol 691: 39-67. Fleming, J. M., Miller, T. C., Meyer, M. J., Ginsburg, E. and Vonderhaar, B. K. (2010). Local regulation of human breast xenograft models. J Cell Physiol 224(3): 795-806. Greenberg, N. M., DeMayo, F., Finegold, M. J., Medina, D., Tilley, W. D., Aspinall, J. O., Cunha, G. R., Donjacour, A. A., Matusik, R. J. and Rosen, J. M. (1995). Prostate cancer in a transgenic mouse. Proc Natl Acad Sci U S A 92(8): 3439-3443. Hoffman, R. M. (1999). Orthotopic metastatic mouse models for anticancer drug discovery and evaluation: a bridge to the clinic. Invest New Drugs 17(4): 343-359. Hubbard, G. K., Mutton, L. N., Khalili, M., McMullin, R. P., Hicks, J. L., Bianchi-Frias, D., Horn, L. A., Kulac, I., Moubarek, M. S., Nelson, P. S., Yegnasubramanian, S., De Marzo, A. M. and Bieberich, C. J. (2016). Combined MYC activation and Pten loss are sufficient to create genomic instability and lethal metastatic prostate cancer. Cancer Res 76(2): 283-292. Hurley, P. J., Hughes, R. M., Simons, B. W., Huang, J., Miller, R. M., Shinder, B., Haffner, M. C., Esopi, D., Kimura, Y., Jabbari, J., Ross, A. E., Erho, N., Vergara, I. A., Faraj, S. F., Davicioni, E., Netto, G. J., Yegnasubramanian, S., An, S. S. and Schaeffer, E. M. (2015). Androgen-regulated SPARCL1 in the tumor microenvironment inhibits metastatic progression. Cancer Res 75(20): 4322-4334. Ittmann, M., Huang, J., Radaelli, E., Martin, P., Signoretti, S., Sullivan, R., Simons, B. W., Ward, J. M., Robinson, B. D., Chu, G. C., Loda, M., Thomas, G., Borowsky, A. and Cardiff, R. D. (2013). Animal models of human prostate cancer: the consensus report of the New York meeting of the Mouse Models of Human Cancers Consortium Prostate Pathology Committee. Cancer Res 73(9): 2718-2736. Kilkenny, C., Browne, W. J., Cuthill, I. C., Emerson, M. and Altman, D. G. (2010). Improving bioscience research reporting: the ARRIVE guidelines for reporting animal research. PLoS Biol 8(6): e1000412. Killion, J. J., Radinsky, R. and Fidler, I. J. (1998). Orthotopic models are necessary to predict therapy of transplantable tumors in mice. Cancer Metastasis Rev 17(3): 279-284. Kuo, T. H., Kubota, T., Watanabe, M., Furukawa, T., Kase, S., Tanino, H., Saikawa, Y., Ishibiki, K., Kitajima, M. and Hoffman, R. M. (1993). Site-specific chemosensitivity of human small-cell lung carcinoma growing orthotopically compared to subcutaneously in SCID mice: the importance of orthotopic models to obtain relevant drug evaluation data. Anticancer Res 13(3): 627-630. Oliveira, D. S., Dzinic, S., Bonfil, A. I., Saliganan, A. D., Sheng, S. and Bonfil, R. D. (2016). The mouse prostate: a basic anatomical and histological guideline. Bosn J Basic Med Sci 16(1): 8-13. Park, S. I., Kim, S. J., McCauley, L. K. and Gallick, G. E. (2010). Pre-clinical mouse models of human prostate cancer and their utility in drug discovery. Curr Protoc Pharmacol Chapter 14: Unit 14 15. Simons, B. W., Durham, N. M., Bruno, T. C., Grosso, J. F., Schaeffer, A. J., Ross, A. E., Hurley, P. J., Berman, D. M., Drake, C. G., Thumbikat, P. and Schaeffer, E. M. (2015). A human prostatic bacterial isolate alters the prostatic microenvironment and accelerates prostate cancer progression. J Pathol 235(3): 478-489. Slaoui, M. and Fiette, L. (2011). Histopathology procedures: from tissue sampling to histopathological evaluation. Methods Mol Biol 691: 69-82. Wang, S., Gao, J., Lei, Q., Rozengurt, N., Pritchard, C., Jiao, J., Thomas, G. V., Li, G., Roy-Burman, P., Nelson, P. S., Liu, X. and Wu, H. (2003). Prostate-specific deletion of the murine Pten tumor suppressor gene leads to metastatic prostate cancer. Cancer Cell 4(3): 209-221. Watson, P. A., Ellwood-Yen, K., King, J. C., Wongvipat, J., Lebeau, M. M. and Sawyers, C. L. (2005). Context-dependent hormone-refractory progression revealed through characterization of a novel murine prostate cancer cell line. Cancer Res 65(24): 11565-11571. Wilmanns, C., Fan, D., O'Brian, C. A., Bucana, C. D. and Fidler, I. J. (1992). Orthotopic and ectopic organ environments differentially influence the sensitivity of murine colon carcinoma cells to doxorubicin and 5-fluorouracil. Int J Cancer 52(1): 98-104. How to cite: Hughes, R. M., Simons, B. W. and Hurley, P. J. (2017). 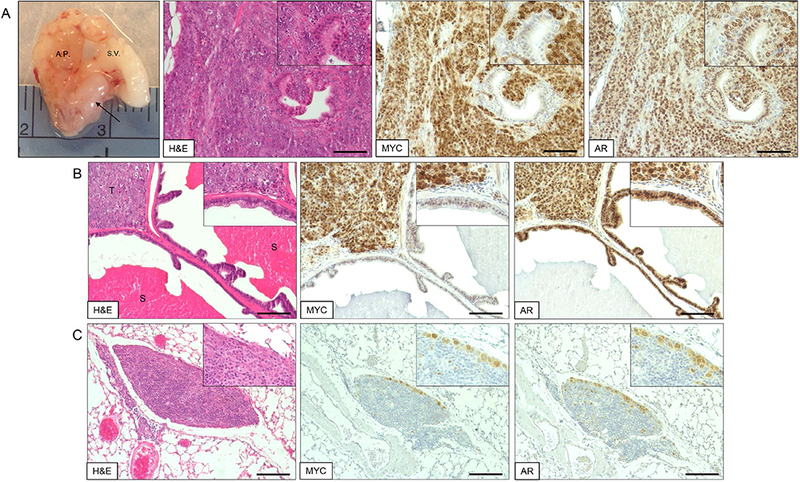 A Murine Orthotopic Allograft to Model Prostate Cancer Growth and Metastasis. Bio-protocol 7(4): e2137. DOI: 10.21769/BioProtoc.2137.